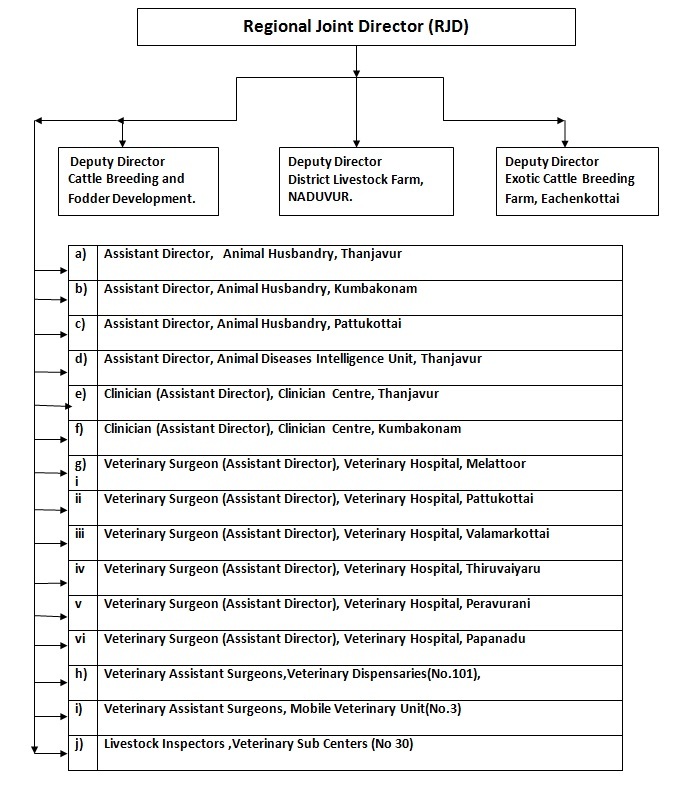 Animal Husbandry Department, Thanjavur plays a major role on the development of Rural and urban economy. Also plays an important role on employment opportunities to the poor , uneducated, educated people etc.. The Department pays topmost care to produce more milk, meat, egg, skin, bones, manure, cattle energy (Bullock energy) etc. Priority given to Mahalir (Women) self help group to uplift their living standard. Cross breeding of local cattle with exotic breeds(Jersey) and up gradation of local water buffaloes with Murrah Buffaloes by way of Artificial Insemination. Prophylactic vaccination against infection diseases like Anthrax, Black Quarter, Hemorrhagic Septicemia, Rabies, Foot and mouth diseases, Blue tongue, PPR etc. Treatment of sick animals, minor and major operations in animals. Training of farmers regarding latest Technologies at field level as well as university level. Control of Zoonotic diseases in Human beings. During the financial year 2017-18, 250 Free Milch Cows have been distributed to 250 poorest rural women in 5 Village Panchayats at the cost of 1.013 crores. Under Free Sheep/goat Schemes, 26,544 Sheep/goat have been distributed to 6636 poorest of the poor rural women in 133 Village Panchayats at the cost of 8.64 crores. Under this centrally sponsored Scheme 4010 milch animals have been insured at the cost of Rs.7.26 Lakhs. If any death during this Insurance coverage period, the cost of the animal will be immediately settled by the insurance company to the beneficiaries and thus supporting the maintenance of their economic status. Night Shelter for 20 birds have been distributed at the cost of Rs.1500/- per beneficiary with the total estimate of Rs.13.95 lakhs. Scheme for Poultry Development (SPD)This scheme was introduced during the year 2012-13. The main object of this scheme is the production of Native Chicken which is having a greater market value.The age Marketing of Native Chicken is 12 weeks of age. Under this programme, 250 day old chicks will be supplied to the farmers.During the year 2017-18, 160 beneficiaries have been selected and the chicks, were distributed. Every farmer is supplied with 3 Batches of chicks. Total subsidy released per beneficiary will be 21875. For 160 beneficiaries it will be 35 lakhs and consumption. Conclusion : Since the demand for native chicken is increasing day by day, the farmers get minimum of Rs.100/- bird as profit.